An illustration sometimes find helpful in understanding analog signal ranges is to consider the signal range as a length expressed on a number line. This same “number line” approach may be used to visualize any conversion from one analog scale to another. 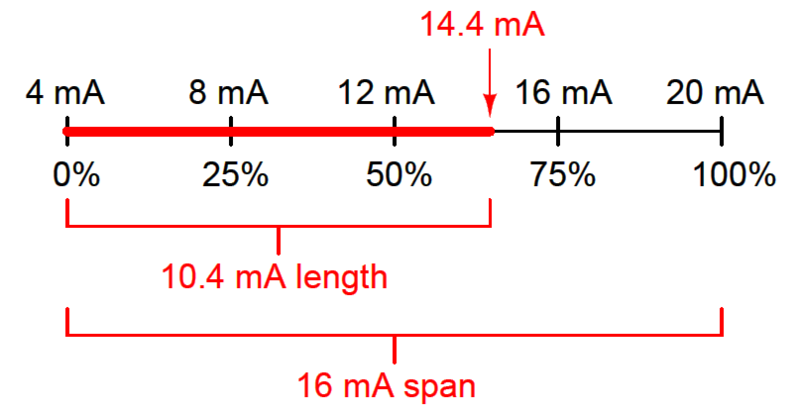 Consider the case of an electronic pressure transmitter calibrated to a pressure range of −5 to +25 PSI, having an (obsolete) current signal output range of 10 to 50 mA. Solving for the unknown (?) current by cross-multiplication and division yields a value of 22.67 mA. Of course, this value of 22.67 mA only tells us the length of the line segment on the number line; it does not directly tell us the current signal value. To find that, we must add the “live zero” offset of 10 mA, for a final result of 32.67 mA. Thus, an applied pressure of +12 PSI to this transmitter should result in a 32.67 mA output signal.